My dog Daisy on Wollaston Beach in Quincy. Glad to meet Miss Daisy! Since 4 days, you're sharing a very beautyful stroll near the sea A very unusual (for me!) side of Boston, and very beautyful;I guess during summer the place is crowded?.. I am sure Daisy had fun on the beach!! I like to meet bloggers dogs in photos. Daisy looks like a sweetheart. I'll bet she has fun a the beach! I cant really figure out as what Daisy is really standing on. Seems like she is as curious as I am. I'm enjoying these beach rambles of yours recently. Hey! When did Boston annex Wollaston? Just kidding. Some CDP bloggers are very strict about locale. I'm not. ncl-cruise-pictures. 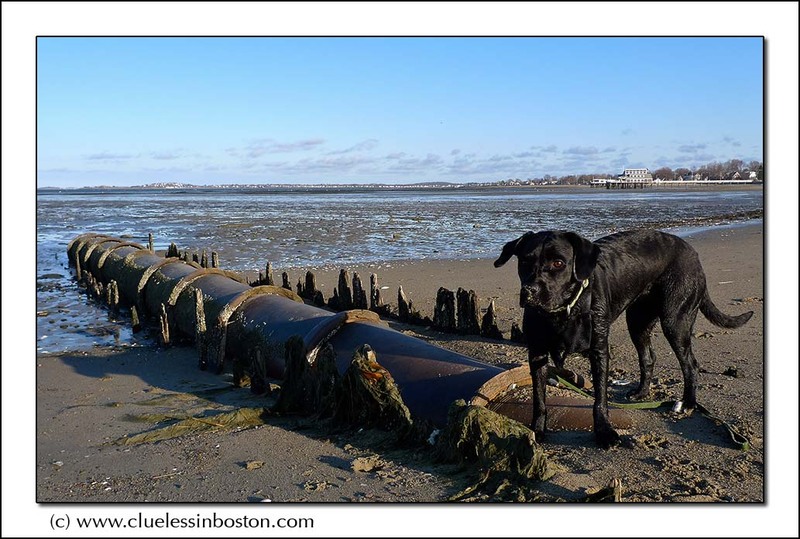 Daisy is standing on a pipe that used to send waste into Boston Harbor. Fortunately, the harbor has been cleaned and these are no longer used.